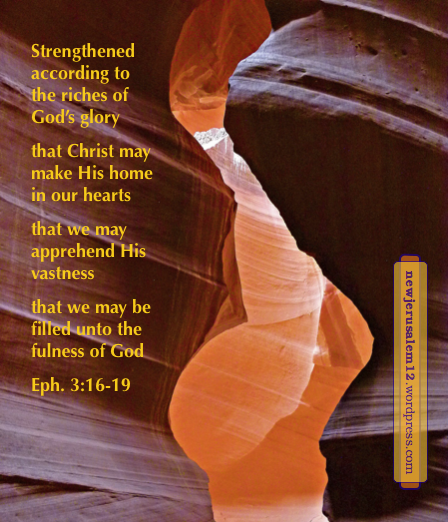 We are strengthened so that Christ may make His home in our hearts; Eph. 3:16-17. The final praise I found in Revelation is verse 19:7: “Let us rejoice and exult, and let us give the glory to Him, for the marriage of the Lamb has come, and His wife has made herself ready.” This points directly to New Jerusalem, the wife of the Lamb. In Revelation 21:9-11 the angel showed John the holy city, New Jerusalem, as the bride, the wife of the Lamb, having the glory of God. The bride making herself ready in 19:7 is her seeking and allowing Christ to saturate her so that she expresses Him as the glory of God. On one hand, this seeking is our responsibility because 19:7 says that we, the wife, made ourself ready. On the other hand, we cannot do anything in ourselves. Our seeking is for the Father to strengthen us through His Spirit so that Christ may make home in our hearts (Eph. 3:14-17). It is also a pursuing of Christ so that He may live in us and be formed in us (Gal. 2:20, 4:19). We present ourselves, seek, and pursue Christ that we may get ready with Him as our content and expression to match Him and be His wife, New Jerusalem. 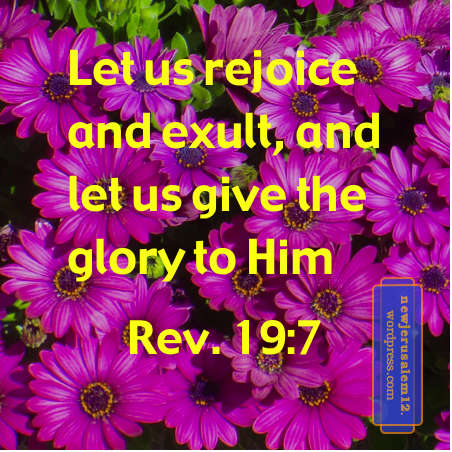 Here are more posts about the rejoicing, exulting, glory, and the wife made ready in Revelation 19:7 and the related preparation of the bride in 21:2. 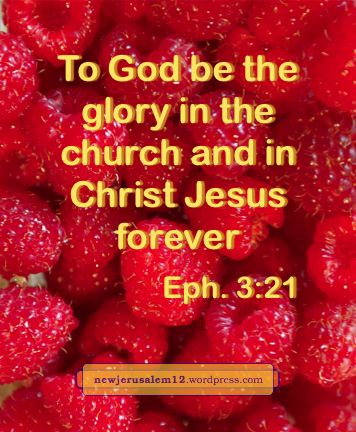 New Jerusalem is a city, “having the glory of God” (Rev. 21:10-11). This glory is not monotone but is an exceedingly rich glory. 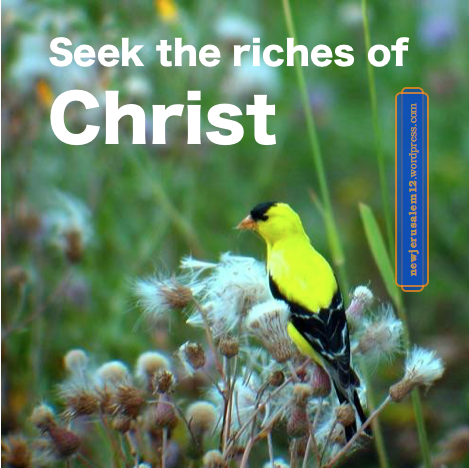 Colossians 1:27 speaks of “the riches of the glory of this mystery…which is Christ in you, the hope of glory.” The mystery of God’s eternal purpose is Christ in us. This mystery comes with riches of glory. Today we do not realize so much of the riches nor is the glory manifested. God willed to make known this mystery to His believers. His making known to us is in this age. His making known to the whole earth will be in the next age and through New Jerusalem. This strengthening results in Christ making home in our hearts so that get rooted and grounded in love (v. 17) which enables us to corporately apprehend the vastness of Christ (v. 18), leading to being “filled unto all the fulness of God” (v.19). The riches of the glory, both now and with New Jerusalem, cannot be separated from Christ Himself. The filling spoken of in Ephesians 3 for this age is a precursor to New Jerusalem. The process begins with our being strengthened according to the riches of God’s glory and results in the expression of these riches. This process is not visible to natural eyes, but the result will be visible to everyone in the new creation. Ephesians 3:16-17 are a prayer for our Father to strengthen us so that Christ may make His home in our hearts. This home-making is in the realm of faith. Likewise, everything related to New Jerusalem is in the realm of faith, in the spiritual realm. The strength in verse 18 is not our human strength; it comes out of Christ making home in us. This strength is Christ living in us. This enables us to apprehend together the vastness of Christ, a vastness which will be manifested to the fullest in New Jerusalem. Then we can know the excellent love of Christ. 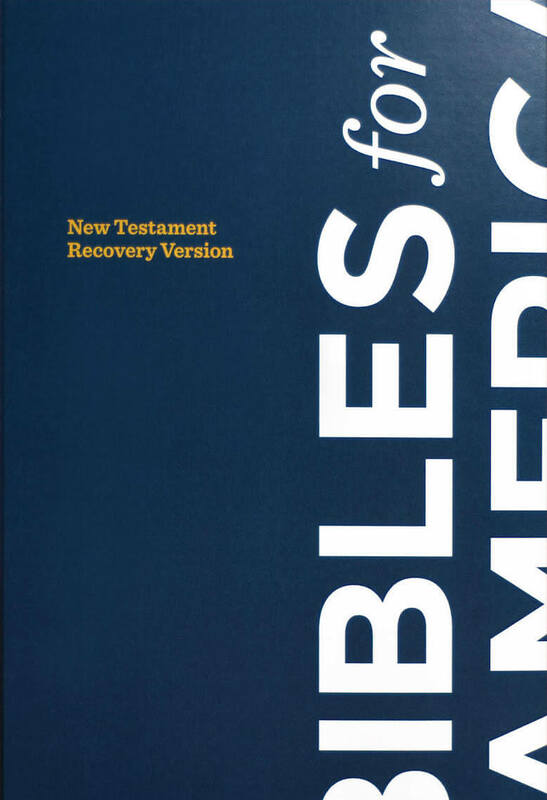 The conclusion of Ephesians 3:16-19 is that all the believers together are “filled unto all the fullness of God.” This is a foretaste of New Jerusalem. God desires to fill His corporate people with all that He is in Christ, so that all He is may be manifested through His people. Ultimately New Jerusalem will be our corporate manifestation of all that God is. New Jerusalem is the enlargement of God’s present operation in His people. This enlargement is God’s growth, His increase, in us (Col. 2:19). This growth is seen in Ephesians 3:16-19. In verse 14 Paul began a prayer. In verse 16-17 he asks that the Father strengthen us into our inner man so that Christ can make His home in our hearts. 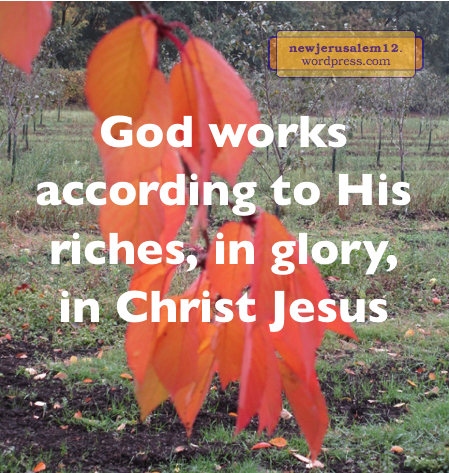 This home-making is the growth of God in us, which ultimately is for New Jerusalem. __Small things, big things, anything and all things—He’s involved in all. __Person, Person, Jesus is our Person, Living now in us. __He’s our tastes, our attitudes and actions; Oh, how glorious! 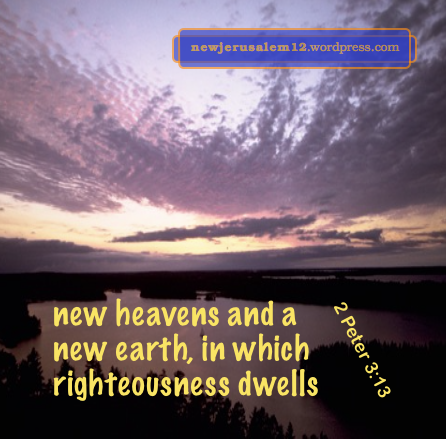 The sixth verse includes His bride, New Jerusalem (Rev. 21:2). Certainly His growth in us is by our experience of His death and resurrection, as in the first three verses. 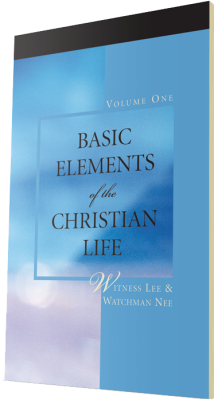 Practically, this growth, Christ making home in our hearts, is “He’s our tastes, our attitudes and actions.” All our natural tastes, attitudes, preferences, opinions, desires, and likes and dislikes must be washed away and replaced by His tastes, His preferences, His likes and dislikes, etc. This is an aspect of our growth unto New Jerusalem. We can pray with this hymn, As life in every way, Be our Person, Lord, each day. 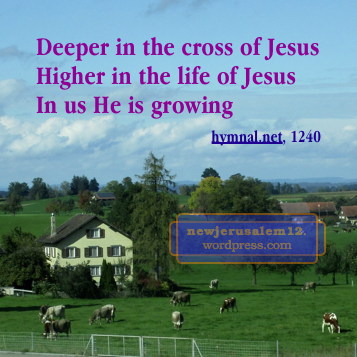 Lord, grow in us toward New Jerusalem.